Memory card manufacturers are constantly improving cards with greater speed and capacity. Though the form factor remains the same, the interior of cards are totally different. Today, cameras can record 4K video onto microSD cards and RAW HD video onto SD cards. Yet, each camera has a spec and recommends specific cards. When memory cards cite their read and write speeds, terms like “up to” or “maximum” are often used. Don’t take this literally. This means the maximum burst speed of the card. That speed might last only for a few seconds, but will not work for sustained data transfers demanded when shooting video. A card's advertised maximum speed isn’t a reliable yardstick for performance. When examing memory cards, it is important not to confuse bits and bytes. Bits are abbreviated with a lowercase b (as in Mb/s), while bytes are abbreviated with a capital B (MB/s). There are eight bits in one byte. Video recording codecs will list their speeds in bits per second, while cards list their speeds in bytes per second. So when a video camera like the Panasonic GH4 records at 100 Mb/s, that’s actually 12.5 MB/s. Memory cards do have a system of measurement to help users sort out the truth about performance. To the eye of a novice, these measurements appear to be random numbers, which can be confusing. But it is important to understand and use them. 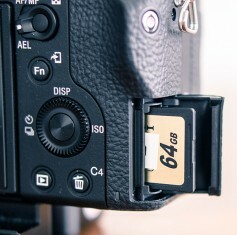 SD cards, while all looking the same, are either SD, SDHC or SDXC types. The file format each uses is different, which determines the maximum capacity of the card. Standard SD cards have a maximum capacity of 2GB, while SDHC cards max out at 32GB. SDXC cards can support up to 2TB. The type does not affect the card’s speed, however. In fact, an SDHC card can be just as fast as an SDXC card. Some newer SD cards have a UHS (Ultra High Speed) classification, which determines the maximum speed at which the card can read. Non-UHS SD cards max out at 25 MB/s, but UHS cards can work much faster. Currently, there are UHS-I Cards, which have a maximum theoretical speed of 104 MB/s, and UHS-II cards that allow for a maximum transfer speed of 312 MB/s. Since card manufacturers almost always only give users the burst read and write speeds instead of sustained speeds, it can be difficult to pick out a card for video. Many 4K cameras write at very high bit rates. In such situations, burst speed means little. To determine the minimum write speed of a card, you need to look at its speed class rating. This rating means that the card has been verified to never write slower than other cards in its class. Though the speed of cards may vary, users can be comfortable knowing that any card with a speed class rating will never write slower than the rated speed. 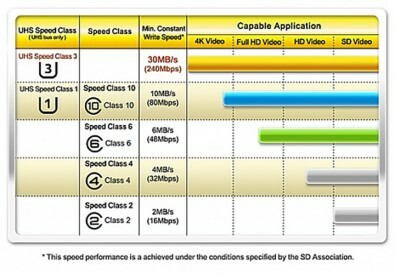 The SD Association has also recently introduced a video speed class rating to identify cards capable of 8K, 4K, 3D and 360-degree video. This speed class is just another way of verifying the minimum sustained write speeds of cards. For users who want the fastest SD cards available, UHS-II, Class U3 cards are the place to go. 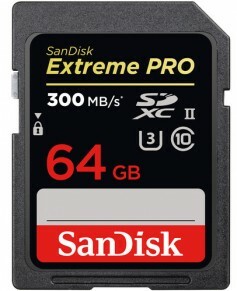 In this category are SanDisk Extreme PRO UHS-II cards, available in 16GB, 32GB, 64GB and 128GB capacities. These offer read speeds up to 300 MB/s and write speeds up to 260 MB/s. Delkin also offers 32GB, 64GB, 128GB and 256GB UHS-II cards with a read speed of 285 MB/s and a write speed of 100 MB/s. Lexar’s Professional 1000x UHS-II cards are available in capacities of 16GB, 32GB, 64GB, 128GB and 256GB. They offer a slightly slower maximum read speed of 150 MB/s and a maximum write speed of 80 MB/s. Lexar also manufactures the Professional 2000x UHS-II series in capacities of 32GB, 64GB and 128GB that deliver a maximum read speed of 300 MB/s and a maximum write speed of 260 MB/s. For users without a UHS-II-capable camera or computer, the SanDisk Extreme Pro UHS-I U3 memory card line is a fast card. It is available in 32GB, 64GB, 128GB and 512GB capacities. These cards offer read speeds up to 95 MB/s and write speeds up to 90 MB/s, very close to the maximum possible speed of UHS-I. MicroSD cards share the same UHS and class properties as their cousins. Like full-size SD cards, the fastest microSD cards are UHS-II, class U3 cards. 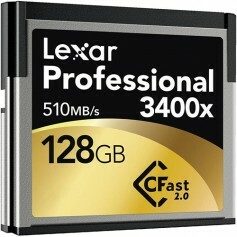 Currently, Lexar offers its Professional UHS-II 1000x, Class U3 cards in capacities of 32GB, 64GB and 128GB, while offering read speeds up to 150 MB/s and write speeds up to 45 MB/s. Lexar also offers the same capacities for its Professional 1800x UHS-II lineup, which provides maximum read speeds of 270 MB/s and maximum write speeds of 115 MB/s. SanDisk’s Extreme PRO UHS-II cards come in capacities of 64GB and 128GB, offering read speeds up to 275 MB/s and write speeds up to 100 MB/s. However, UHS-II microSD cards are new, and the chances are that your microSD-compatible device won’t be able to take advantage of the fast speeds offered by UHS-II. If that’s the case, UHS-I U3-rated cards are also worth a look from the same manufactuers. Another category of memory is CFast Cards, which use SATA connectors to interface with cameras and computers. The new CFast 2.0 cards use SATA III, meaning they allow for the same maximum transfer rate of 6 Gb/s (750 MB/s) as SATA III drives. CFast 1.0 operates at SATA I (1.5 Gb/s) speeds and CFast 2.0 operates at SATA III (6 Gb/s) speeds. CFast Type I and Type II refer to the thickness of the physical card media, with Type II cards being slightly thicker (5mm) than Type I (3.3mm). Thus, a CFast Type II card cannot be used in a device that only supports CFast Type I, but Type I cards can be used with Type II devices. Currently, SanDisk, Delkin Devices, Transcend and Hoodman offer CFast 2.0 cards, while Lexar makes 3500x and 3600x versions. These cards are available in capacities ranging from 64GB to 256GB and all feature fast read and write speeds. The fastest read speeds of 560 MB/s belong to the cards from Delkin Devices and Hoodman, while the fastest write speed of 495 MB/s belongs to Delkin Devices’ CFast 2.0 card. The other cards mentioned here aren’t slow and offer read speeds ranging from 510-540 MB/s and write speeds ranging from 370-455 MB/s. Memory cards are changing almost daily, with new levels of capacity and speed being introduced frequently. The best way to get the best card for each device is to read the device’s documentation and look for a list of recommendated media. When you venture beyond the recommendations, be ready for surprises.